The Minimalist Man, an interesting choice, but ‘The Minimalist Man’ is the title the Telegraph has given me in the article they’ve published over the weekend. 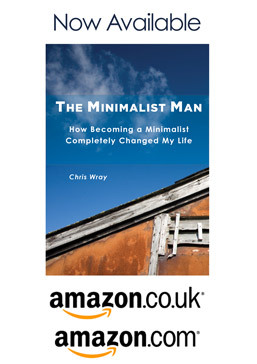 For those interested in my story of becoming a minimalist, it may shed some light on how I arrived here from what some would call a ’normal’ life and possibly a ’successful’ career. As the human subject of the article, it tugs a little on the emotions, and putting out there is possibly a little bit more than I’m comfortable with. I’m told that this forms the most engaging content for readers. I suggest you decide for yourself and offer comments below. The Telegraph article is here. Love your story. Have been devouring the U.S. minimalist blogs for a couple of years but so refreshing to hear a British voice on the subject.